The future is as disruptive and unpredictable as ever, especially in the world of business. As a business owner, this can be a confusing and especially frustrating thing to prepare for as you sit down to update your business plans. That isn’t the recipe for a sustainable business. 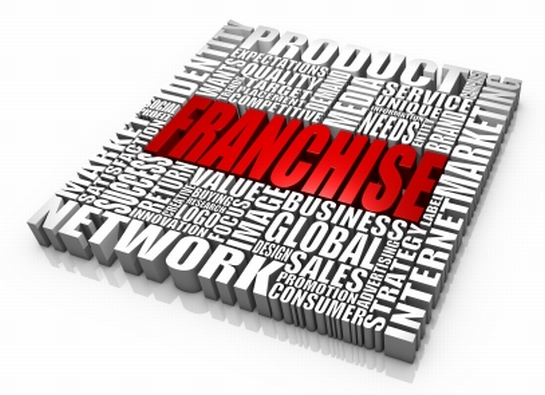 The recipe for maintaining a sustainable business is to take ownership of your business, no matter what happens. 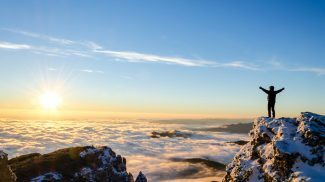 Even though you might not be able to predict what happens or when it will happen, you can get a broad overview of some trends that have a high probability of impacting you in the very near future. For a look at some trends, look no further than the below book list. The below list of 10 books offers insights on strategy, trend spotting, startup generation and organizational learning. Feel free to take a look and see if one (or more) of these books could offer some insight into the direction that you want to take your business. 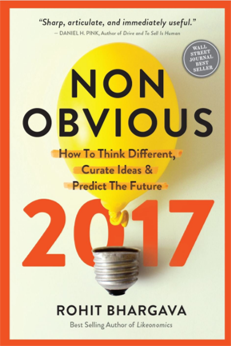 Making sense of trends for your strategic advantage is the subject of Non-Obvious 2017 Edition: How To Think Different, Curate Ideas & Predict The Future by Rohit Bhargava. This book is more than an expert’s prediction about the “next big thing” to impact your future. It is an invitation to think differently by making connections and creating insights that others might miss. In short, Bhargava wants to help readers become their own “trendspotters”, able to focus in on and leverage relevant trends that can impact their future. Like the 2016 edition reviewed by Small Business Trends, this updated edition discusses the weird and wacky stories that are creating tomorrow’s trends, including “Skinterface” tattoos (a suit that allows your body to interact with virtual reality) and quiet eating (a trend that started in Spain which serves as a cultural backlash against loud and crowded eating). Through these stories and advice, Bhargava hopes readers will adopt the “trend-spotting” mindset that increases their ability to gain control of their own futures. Like the best-selling The 4 Hour Workweek by Tim Ferriss, Idea to Execution: How to Optimize, Automate, and Outsource Everything in Your Business advises readers to outsource their nonessential tasks to virtual assistants. Unlike Ferriss’s book, it is designed to help readers create and launch a startup with a minimal investment in time or planning (the authors made their plans on a cocktail napkin and launched in 24 hours). Authors Ari Meisel and Nick Sonnenberg walk readers through a month-by-month playbook of how to set up and maintain that startup. They provide specific recommendations on cultivating talent, labor, finances, strategy and other resources at each level of their fast-growing business. 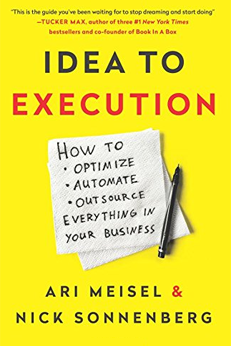 Idea to Execution offers a redefinition of everything you thought about startups, business planning and utilizing resources in the pursuit of your dreams. Move over Millennials! It’s time for business owners to start preparing for Generation Z now! As Gen Z Effect: The Six Forces Shaping the Future of Business is quick to point out, business disruption is now an established reality. But the speed and consequences of this current age of business disruption we are facing continues to increase. According to authors Tom Koulopoulos and Dan Keldsen, this kind of disruption is a new phenomenon in history, giving rise to unprecedented opportunities but also new threats. The Gen Z Effect looks at the impact of six forces on the post-Millennial generation with a look at the social and technological changes that will affect this generation. 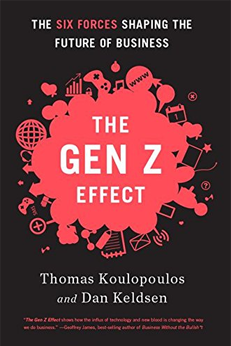 For business owners and marketers, trying to reach out to the Millennial and post-Millennial generation, this book provides a window into the potential world of Generation Z from the individual to the overall changes in society. For businesses seeking to survive in the age during and after Millennials, this book offers a chance to look beyond the trends and into the forces that shape them. What do you do in a world of constant change? Learn faster. 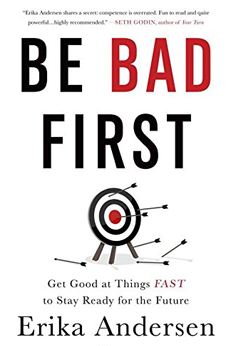 With Be Bad First: Get Good at Things Fast to Stay Ready for the Future, author Erika Andersen urges leaders to get into a a new habit of continuous learning and upgrades. In this world, knowledge isn’t something that you master once and for all, it’s a process that leads to faster innovation and adaptation. Andersen claims that our “I’ll learn it when I absolutely have to!” response is a liability in a world where knowledge doubles every few months (compared to in years and decades of the past). Andersen’s ANEW model discussed in the book helps readers transition from that “learning at the last minute” world into one where learning is dynamic, interactive, and self-driven (compared our mostly institution-driven approach today). This type of learning also involves courage, hence the title Be Bad First, to act on what we learn without waiting for others to do it first. Andersen claims that our “I’ll learn it when I absolutely have to!” response is a liability in a world where knowledge doubles every few months (compared to years and decades of the past). Andersen’s ANEW model discussed in the book helps readers transition from that “learning at the last minute” world into one where learning is dynamic, interactive and self-driven (compared to our mostly institution-driven approach today). This type of learning also involves courage — hence the title Be Bad First — to act on what we learn without waiting for others to do it first. Need an appropriate response to the disruptive nature of the future? Start by disrupting yourself. 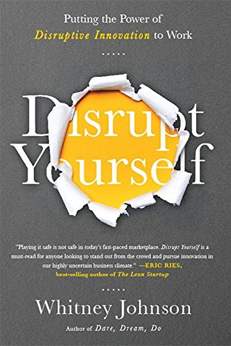 In Disrupt Yourself: Putting the Power of Disruptive Innovation to Work, author Whitney L Johnson describes how you can do this just by creating a need for a market that doesn’t even exist yet. How do you do that? Johnson advises readers to take advantage of the “S-curve”, a model used in mathematics and business to measure things without predictable growth. The S-Curve starts off slowly, then accelerates at a massive rate, eventually landing on a plateau after hitting a certain point. A graph of this growth looks like an “S”. Johnson believes companies and individuals can use this “S curve” to take advantage of the seemingly insignificant things in our lives and businesses with a big impact on our future. When we understand and take control of that S-curve, we are able to take the driver’s seat and lead disruption instead of getting crushed by it. 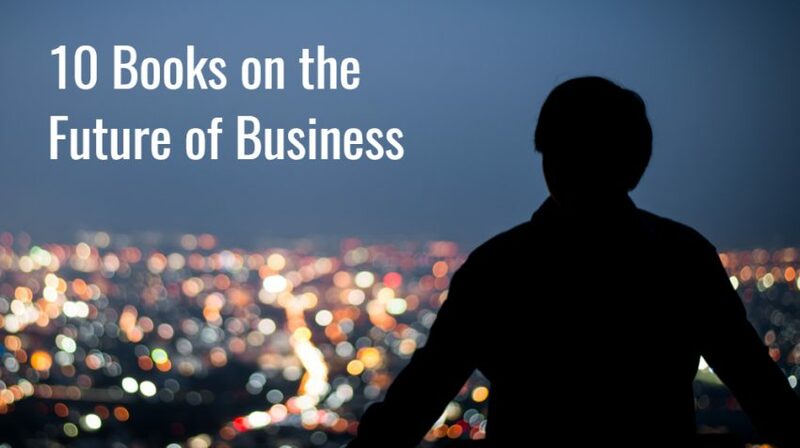 This isn’t a business-themed book but it offers some valuable insight on factors that affect business. Progress: Ten Reasons to Look Foward to the Future brings some balance to the gloom and doom on this book list. Everywhere you look, there seems to be a dismal and fatalistic attitude that we are doomed to an unpredictable and bewildering future. A lot of the talk about the future centers around questions over whether robots will take over jobs, whether climate change will seriously impact our survival, and whether we are capable of creating a society of equality. Johan Norberg confronts these seemingly unfixable problems and offers a bit of hope. Using statistics from the United Nations and other global organizations, Norberg helps readers understand the progress that has been made in the last decade. 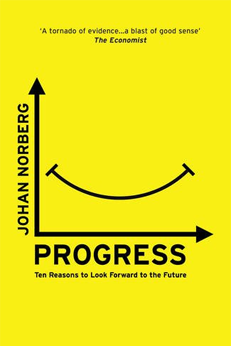 Although our world hasn’t fully solved society’s most pressing concerns, as Norberg points out in the book, we have made a lot of progress. By shining a light on the progress we have made, all of us become more willing to take the risks that will turn that progress into reality. As mentioned above, much of the current talk about the future paints a rather dismal and unpredictable picture. These books focus on helping you and your business survive. The Future Belongs to Those Who Dare: Choosing Your Life through Strategic Futuring takes a different approach. It focuses on thriving in that future as it grows closer with each passing minute. The book focuses on our current abilities as human to dream and act on those dreams to make them a reality (aka futuring). 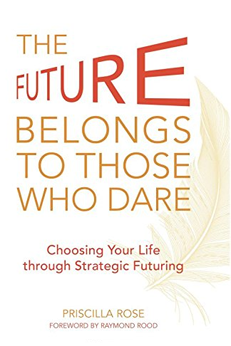 The Future Belongs to Those Who Dare, using the analogy of a golden feather from a Russian folktale, urges readers to tap into their own “futuring” potential through self-analysis and leverage this knowledge into a future that is by design. Carrying “futuring” further, author Priscilla Rose asks readers to build on their own skills by partnering with like-minded individuals to found a new culture of creating. This culture, Rose believes, will summon a new future far surpassing anything ever imagined. In the race to survive (or thrive, depending on your interpretation) the future, many authors focus the individual actions . This “lone wolf” pursuit might have worked in the past, but it won’t in the unpredictable and chaotic world of the future. In this world, collaboration allows individuals, businesses and society as a whole to maximize their potential and control their future. 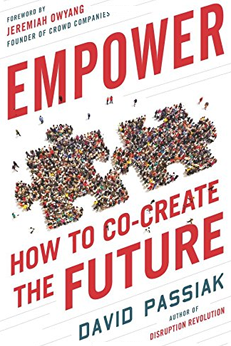 Empower: How to Co-Create the Future, written by a former religious scholar and current tech innovation expert David Passiak, empowers individuals to break away from closed-minded and siloed thinking and into a world of collaboration and community-building. As a glimpse of this world to come, Passiak points to the rise of platform businesses like Uber and Airbnb, which integrate technology and community to create something truly innovative. To give further insight into the world of the creative and sharing economy, Passiak interviews some of the top movers and shakers in the creative and sharing economy. 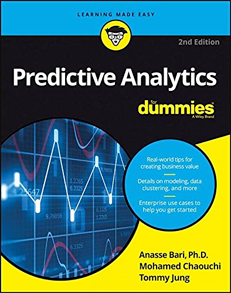 Predictive Analytics for Dummies, written by Anasse Bari Mohamed Chaouchi and Tommy Jung, is intended primarily for people who are familiar with analytics and want to take it up to another level. Predictive analytics is the use of statistics to predict what events are likely to happen based on an in-depth knowledge of past and current data along with the laws or probability. It powers some of the technology behind bank loans (deciding if you are a worthy risk), sports (predicting the next sports superstar), or healthcare (choosing the next drug with the best ROI). The book guides readers slowly through the predictive analytics landscape, providing a broad overview of the field and gradually narrowing down to the processing and executing of data. One particular section interested readers should take note of is the roadmap starting in the third part of the book. This section helps readers — after learning about the use of predictive analytics in the first two sections — to actually design and experiment with predictive analysis techniques. This book list has covered innovation, learning, strategy, economics, startups and leadership in terms of the future. One area not covered is business education, specifically sustainability. The future of business leadership depends on how those leaders are educated. Education shapes the thinking patterns and decisions during an entrepreneur’s life. This will play a larger (and even more important role) in how we relate to our planet. Written by education innovation expert and speaker, Giselle Weybrecht, The Future MBA: 100 Ideas for Making Sustainability the Business of Business Education offers a plethora of ideas detailing how to improve or overhaul (depending on your preference and time) the current model of business education. Weybrecht’s book challenges the notion that business education and sustainability are incompatible or a trend. 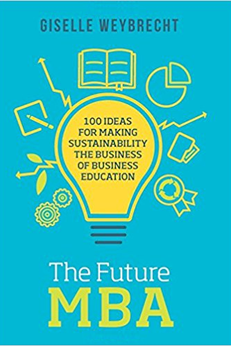 For readers who believe that entrepreneurship can be profitable for business owners and sustainable for the planet, The Future MBA is a guide to show them the way. All of the above books point to some aspect of the future, some aspects of which are in your control (like your business strategy) and some aspects of which are not (like macroeconomic forces). They cannot provide a clear and accurate prediction of the future. No single book or person can. These books, however, can provide some indicators of where the future is going. Why? The future always builds from the seeds of the present. 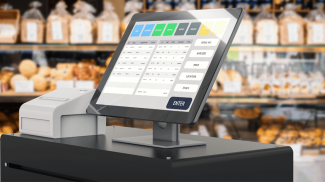 Those businesses who take the time to cultivate their present offerings while keeping an eye on the future will be in the best position to sustain their business now and well into the unpredictable time to come. The business future will always be unpredictable. No matter how many controls you put on it, change is always bound to happen. Your future will depend on the actions that you choose to take today. Great list of books to read. I think that having a plan is essential in running a business.